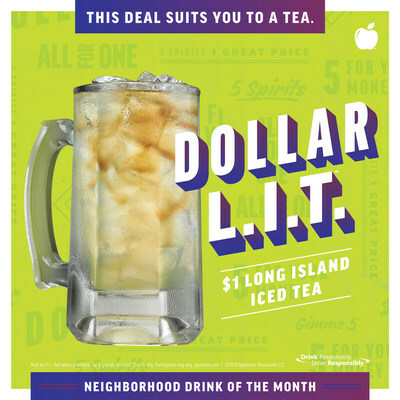 GLENDALE, Calif., June 1, 2018 /PRNewswire/ -- Applebee's® Neighborhood Grill + Bar is celebrating the start of summer with the return of the $1 Long Island Iced Tea, better known as the DOLLAR L.I.T.™, to restaurants nationwide throughout the month. The DOLLAR L.I.T. features five spirits – vodka, rum, gin, tequila and triple sec – mixed with sweet & sour mix, topped with a splash of cola, and served in a 10-ounce mug over ice. "The DOLLAR L.I.T. is a fan favorite in our lineup of Neighborhood Drinks, and we're pumped for the summertime return of this great offer," said Patrick Kirk, vice president of beverage innovation at Applebee's. "For only one buck, our guests can get five deliciously mixed spirits in one glass. Now that's a great way to celebrate the season." Applebee's DOLLAR L.I.T. is available all day, every day while dining in at participating Applebee's locations. Price, participation and hours or availability may vary by location, and guests must be 21-years old or over to enjoy responsibly. Void where prohibited. For more information on the DOLLAR L.I.T. and other limited time offers from Applebee's, view the online menu and stop by your neighborhood Applebee's restaurant.